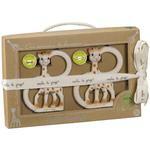 The Sopure Sophie the Giraffe 2 Ball and 2 Block set is the perfect gift for a new baby. 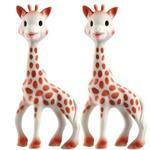 Designed for newborns and older, this set of 2 colorful balls and blocks are made from 100% natural rubber. 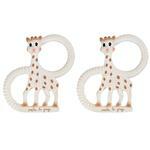 Safe for baby to chew on as they play, manipulating them to develop dexterity. 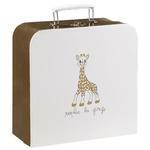 The perfect gift for Baby Shower! 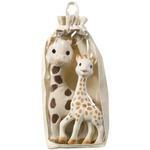 This set has a little something for baby and parent! 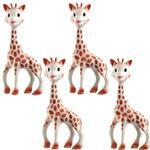 Includes Sophie la girafe, a Swing rattle and a Sophie la girafe keychain. 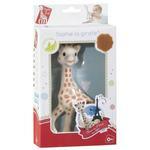 Sophie la giraffe, full of discoveries and activities to awaken babys senses. 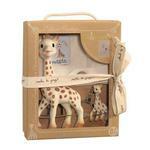 Sight: The dark and contrasting spots all over Sophie la giraffes body provide visual stimulation and make her easily recognizable to baby. 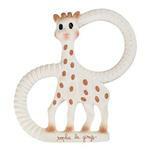 She soon becomes a familiar and reassuring object. Hearing: Her squeaker keeps baby amused, stimulates his hearings, and helps him to understand the link between cause and effect. 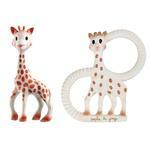 Taste: Sophie la giraffe is very flexible and has lots of parts for baby to chew (ears, horns, legs). 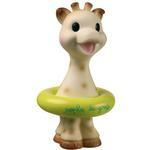 She is perfect for soothing babys sore gums when teething and is completely safe. 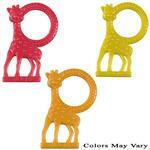 Made of 100% natural rubber and food paint. 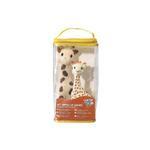 Touch: Sophie la giraffe is perfect for babys small hands. 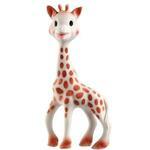 She is very light and her long legs and neck are easy for baby to grip. 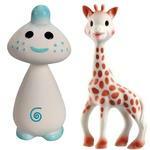 She is very soft to touch, just like babys mummy, stimulating soothing physiological and emotional responses. 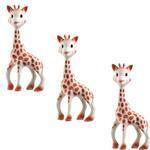 Smell: The singular scent of natural rubber (from Hevea tree) makes Sophie the Giraffe very special and easy for your child to identify amid all his other toys.